Kitchen Tips | Buen provecho...2018! First of all I want to wish you all a Happy and Prosperous New Year! and secondly I want to thank you all for following along on this blog. Fearing you may still be in a New Years Eve fog, I am keeping this simple. Most of us get confused by changing measurement standards depending on the country of origin of a recipe. I discovered this quick reference image on my Facebook page today. Hope this simplifies things for all you cooks! Dont waste money on the exotic spice blends, when you can easily prepare them at home at far less cost. Make only what you need and enjoy the fresh taste, courtesy of Women’s Health Magazine. Now if that isn’t misleading, I do not know what is…LOL. With this being the year end, after we put away the holiday stuff it is back to cleaning up the house and getting rid of stuff we no longer need or use. One of the things we often overlook are our herbs and spices! I have been places where the spices seemed to be quite old (the bottles were the same as in my mothers kitchen) or placed conveniently close to the stove or beside the dishwasher or oven. Yes they might be convenient, but moisture and heat are the enemy of spices and herbs. What follows is some good information about caring for these very important enhancements to our cooking. Dried herbs and spices add a lot of flavor to our dishes and they are easily available and convenient to use. When we blend a combination of spices and herbs we end up with a whole variety of wonderful and unusual tastes. Preserving the quality, freshness and flavor of your seasonings will give you great tasting dishes and really will spice up your palette. Spices do not spoil but they do lose their strength. Stored in airtight containers in cool dry places, spices retain their potency longer than you might have been led to believe. Whole peppercorns, nutmegs and cinnamon sticks tend to hold on to their flavor for a long time. And potent whole spices, such as cloves, cumin, and cardamom will also last for a long time. The greatest importance in getting the best taste and value out of your herbs and spices is to store them well. Store them in tightly sealed containers in a cool dark place. Keeping containers tightly closed will protect them from moisture and oxidation, and they retain more of their essential oil content when stored in glass jars or metal tins. Keeping them away from direct light will keep color from fading. Never store them above your stove or near other heat sources as heat will degrade the quality. Also keep them away from the heat of the stove and the humidity of the dishwasher. If you have ever heard it is good to freeze spices and herbs forget it! Condensation will be a problem each time the bottle comes out of the freezer and is likely to introduce moisture to the spices. And don’t shake herbs or spices out of the bottle directly into something you’re cooking as that will introduce moisture to your spices. Red spices like chili powder, cayenne pepper and paprika can be refrigerated to prevent loss of color and flavor. Spices such as turmeric, curry powders, ground cloves and paprika should be stored in glass or metal containers as their flavors will lessen if left in original packaging. 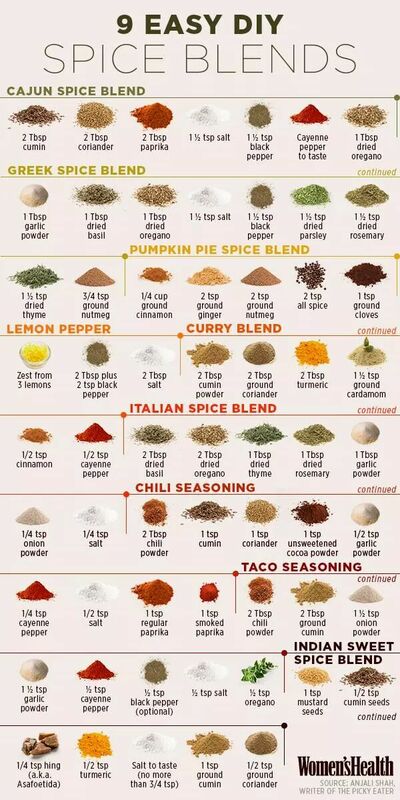 The best temperature for herbs and spices is below 70º F.
Whole spices keep the longest because they have not been cracked or ground which would expose their flavors to air. Ground spices have a shorter shelf life. To determine whether or not ground spices are still viable gently shake the container with the cap on. Remove the cap after a moment and smell the container to see if the rich smell of the spice is still present. So Many Different Recommendations – Which is Correct? The government recommendations for freshness dating is four years for whole spices and two years for ground and you may hear people say that spices should be replaced every six months. But most spices are only harvested once a year, so it certainly doesn’t make sense to replace these every six months. • Whole spices and herbs leaves and flowers will keep 1 – 2 years. • Seeds will keep 2 – 3 years and roots will keep 3 years. • Ground spices and herb leaves keep 1 year. • Ground roots will keep for 2 years. A good practice to follow is to purchase high quality dried herbs and spices in small quantities so that you can easily use them up in reasonable period of time.